백련사 사적비는 백련사 대웅전에서 오른쪽으로 약 50여m 떨어진 지점에 위치하고 있는 높이 447㎝ 규모의 전형적인 석비(石碑)이다. 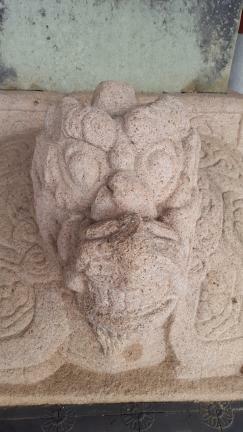 귀부(龜趺), 비신(碑身), 이수(이首)로 구성되어 있는데, 귀부는 고려시대의 조성으로, 비신과 이수는 1681년(조선 숙종 7)에 조성되어 각기 서로 다른 건립연대를 보이고 있다. 귀부는 지대석(地臺石)과 더불어 화강암 일석(一石)으로 조성되었다. 용두(龍頭)는 목을 움츠리고 정면을 응시하고 있는데, 입은 상·하 7개의 가지런한 이빨로 꽉 다문 모습이며, 하단에는 길게 수염이 흘러 목주름까지 늘어져 있다. 위 입술은 약간 들려 눈은 삼각형의 구도 안에 동그란 눈동자가 볼륨있게 표현되었다. 용두의 뿔은 목 뒤로 흐르며 2조로 갈라지며 비좌(碑座)에 연결되어 있다. 귀부의 등면은 너비 30㎝의 음각선으로 곽을 조성한 후 내부에 당초문(唐草紋)을 양각했다. 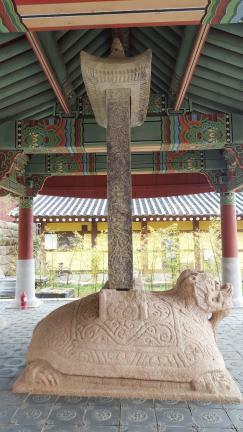 귀갑문(龜甲紋)은 6각형으로 내부에는 연화문을 새겼다. 네 발은 모두 5개의 발가락을 지녔으며, 꼬리는 왼쪽으로 틀어 올렸다. 귀부의 중앙 상면에는 비좌가 조성되었는데, 측면에는 초화문(草花紋)이 양각되었고, 상면에는 118㎝×15㎝ 규모의 비신공(碑身孔)이 마련되었다. 전체적인 양식으로 보아 고려시대 전기에 조성된 것으로 추정된다. 귀부의 크기는 227㎝×190㎝×110㎝이다. 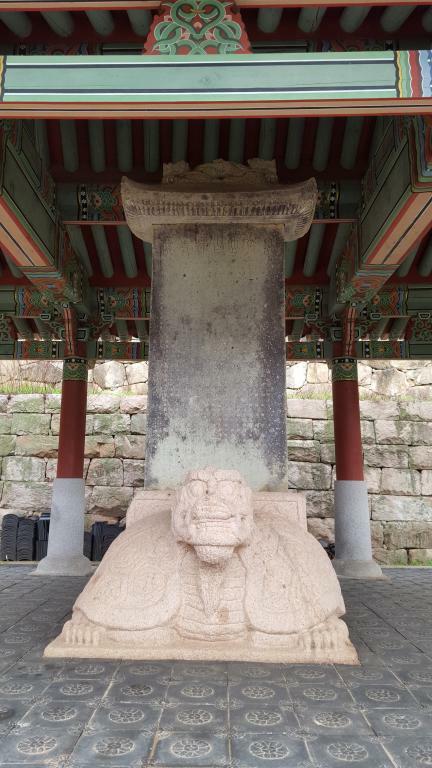 비신은 2면비로 전·후면에는 비문이, 양 측면에는 초화문을 양각했다. 비신 전면의 상단에는 자경 15㎝ 크기의 전서체로 「만덕산백련사비」라 새겼고, 횡서로 「전라도강진만덕산백련사사적비」라 기록하고 있다. 뒷면에는 당시 불사(佛事)에 참여한 사람의 인명이 기록되어 있다. 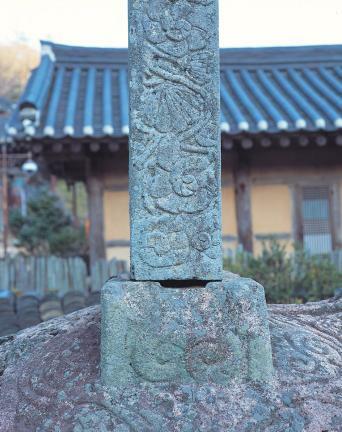 비문은 조정저(1631∼1690)가 지었고, 현록대부랑선군 이우(1639∼1693)가 썼는데, 상단의 전서만은 가덕대부랑원군 이간(？∼1699)이 썼다. 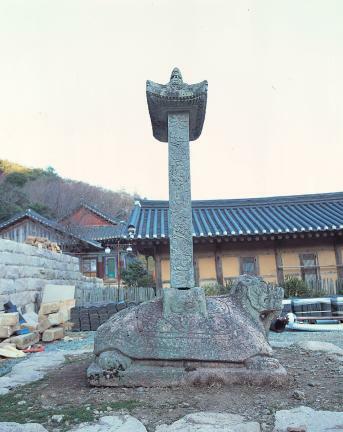 말미의 명문으로 보아 1681년(조선 숙종 7)에 조성했음을 알 수 있다. 이수에는 우진각지붕의 형태로 하단에는 목조 건축의 겹처마를 사실적으로 표현했다. 정상에는 2마리의 용이 등을 맞대고 서로 반대 방향을 보고 있는 형상인 바, 매우 사실적인 조각수법을 보이고 있다. 비신의 크기는 234㎝×118㎝×29㎝이며, 이수는 170㎝×75㎝이다. 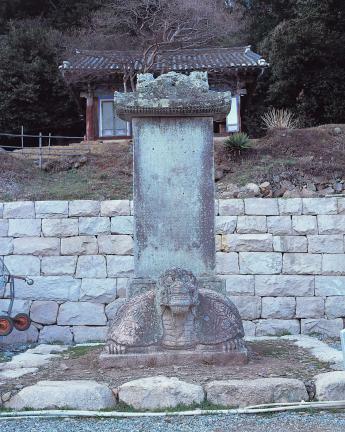 백련사 사적비는 귀부와 비신의 건립연대가 서로 다른 상태이다. 그럼에도 불구하고 전체적으로 보아 귀부는 보존상태가 매우 양호하고, 조각수법도 뛰어나 고려시대 전기의 작풍을 고스란히 지니고 있다. 사적비 역시 전형적인 조선시대 석비의 양식을 잘 보여주고 있는데, 특히 양 측면에 양각된 초화문은 이 시대의 석비로서는 특이한 예라 하겠다. 따라서 백련사 사적비는 귀부와 석비가 비록 시대를 달리하고 있지만, 각 부재가 지닌 양식상의 특성으로 보아 가치가 있다. 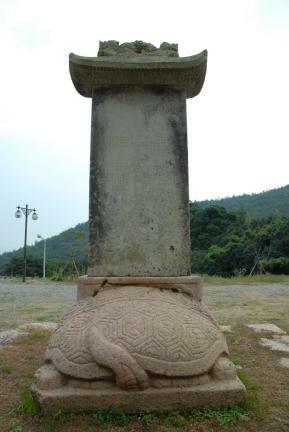 Located about 50m to the right of the Main Hall of Baengnyeonsa Temple, this stele (height: 447cm) is composed of a tortoise-shaped platform, the body, and the head. 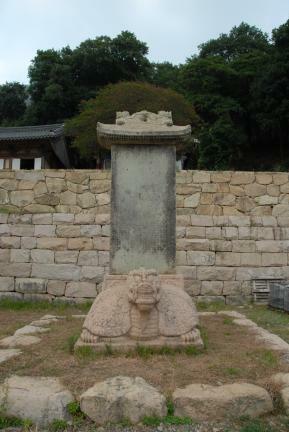 The platform was made in the Goryeo Period (918-1392), whereas the body and the head were completed in 1681 (the 7th year of King Sukjong’s reign). 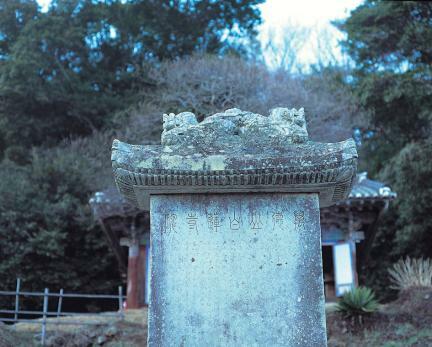 The platform and the foundation are made of a piece of stone. 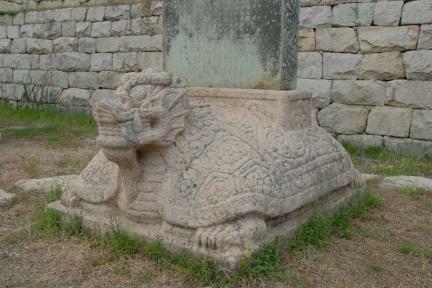 The dragon-headed tortoise has seven neatly arranged teeth. The long beard reaches down to the neck wrinkles. 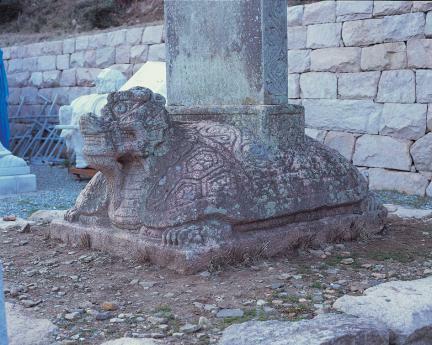 The tortoise has large, round pupils on its eyes. 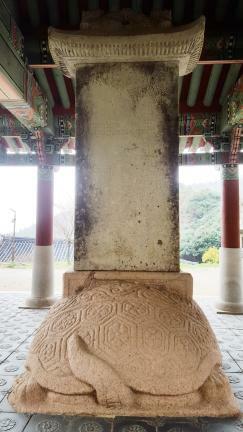 The tortoise shell shows hexagonal patterns with lotus flowers within them. Each of the four feet has five toes. 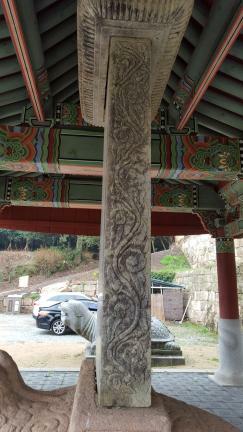 The tail is coiled up to the left. 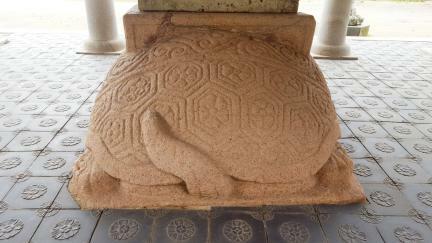 Formed at the center of the tortoise’s back is a rectangular hole (118 x 15cm) to accommodate the monument. 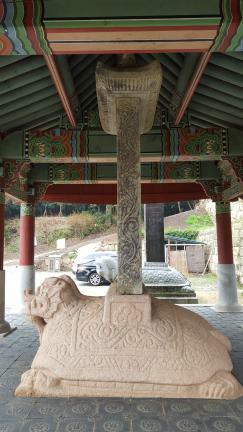 The platform is believed to have been made during the early Goryeo period based on its style. 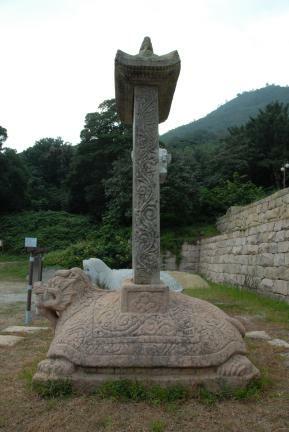 The tortoise platform measures 227㎝×190㎝×110㎝. 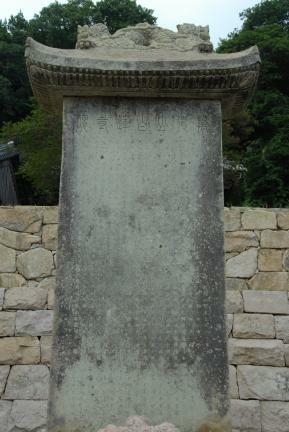 The body of the stele contains epitaphs on both front and back, with grass/flower patterns inscribed on both sides. 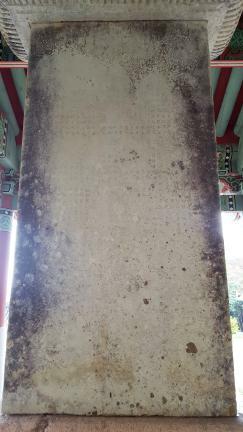 The characters inscribed on the top of the front of the body say that it is a monument recording the history of Baengnyeonsa Temple. 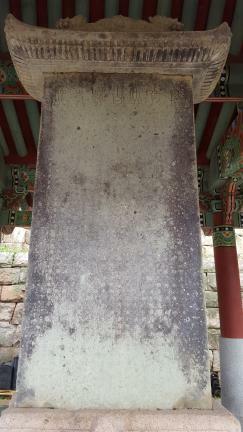 The back of the body lists the names of the people who took part in the work: the epitaph was composed by Jo Jeong-jeo (1631-1690) and handwritten by Yi U (1639-1693), and the characters at the top were handwritten by Yi Gan (?-1699). At the bottom is a statement as to when the body was made (1681). 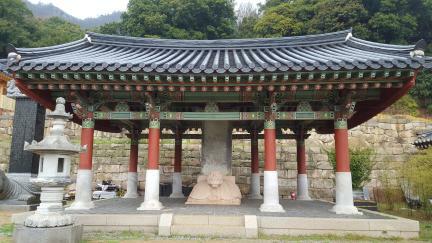 The head of the body was made in the shape of hipped roof with double-layered eaves. 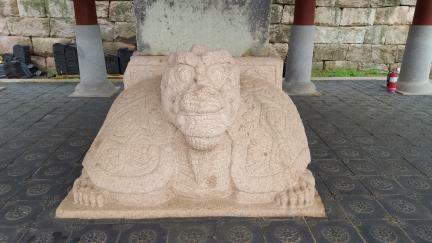 The top of the head shows two dragons sitting back to back. 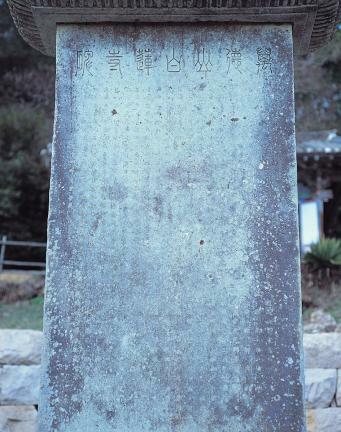 The body measures 234㎝×118㎝×29㎝, and the head, 170㎝×75㎝. 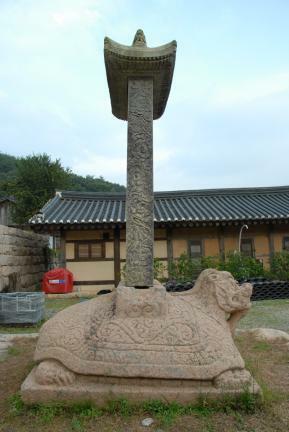 The tortoise platform has been kept very well, displaying the style prevalent in the early Goryeo Period and outstanding sculptural skills. 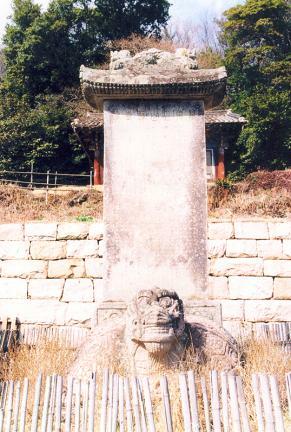 The monument showcases a typical style of the Joseon Period. 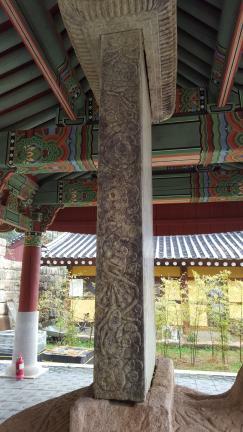 The grass/flower patterns inscribed on both sides of the monument are noteworthy as unique ones contained in a stone monument of the period.